Harkin, who himself served as a Navy pilot, tried to express praise generally for those who join the military on the one hand, while also suggesting that too much of a history with the military should perhaps disqualify a veteran from being a civilian commander-in-chief later: "I just want to be very clear there's nothing wrong with a career in the military ... But now McCain is running for a higher office. He's running for commander in chief, and our Constitution says that should be a civilian ... And in some ways, I think it would be nice if that commander in chief had some military background, but I don't know if they need a whole lot." The complete text of the article from the Des Moines Register can be found here. 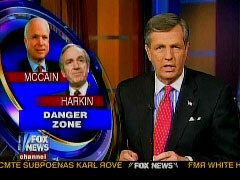 Iowa Democratic Senator Tom Harkin is being criticized for saying that McCain's military background makes him dangerous. Harkin told reporters on a conference call Friday, quote, "He comes from a long line of just military people, so I think his whole worldview, his life view has been shaped from a military viewpoint, and he has a hard time thinking beyond that, and I think he's trapped in that. And I think that can be pretty dangerous." McCain's spokesman called Harkin's remarks "offensive" and said they showed that Democrats are out of touch with American values.